With the popularity of medieval fighting techniques growing at a rapid pace, we wanted to showcase some books that offer translations and insights into fighting manuals from the Middle Ages. Publisher’s Overview: This volume offers an intriguing glimpse into the world of late medieval martial arts, from wrestling to fencing with the longsword to the subtle tricks that could be employed when jousting on horseback. Using superb details of lively pen drawings highlighted with gold leaf, the book features some of the most interesting selections from Fior di Battaglia (The Flower of Battle), a manuscript by the renowned Italian fencing master Fiore dei Liberi depicting the knightly arts of fighting with swords, daggers, and polearms, on foot and on horseback, and in and out of armor. Publisher’s Overview: The “Gladiatoria” group of German fencing manuscripts are several editions of a treatise on armoured foot combat, specifically aimed at duel fighting. Gloriously-illustrated, and replete with substantial commentary, these works are some of the greatest achievements in the corpus of late medieval fight books. These works have both tremendous artistic merit and incalculable historical value. In this remarkable full color volume, authors Dierk Hagedorn and Bartłomiej Walczak elegantly present their work on the copy of this treatise now in the Yale Center for British Art, including a reproduction of the manuscript, a full transcription, and translations into English. 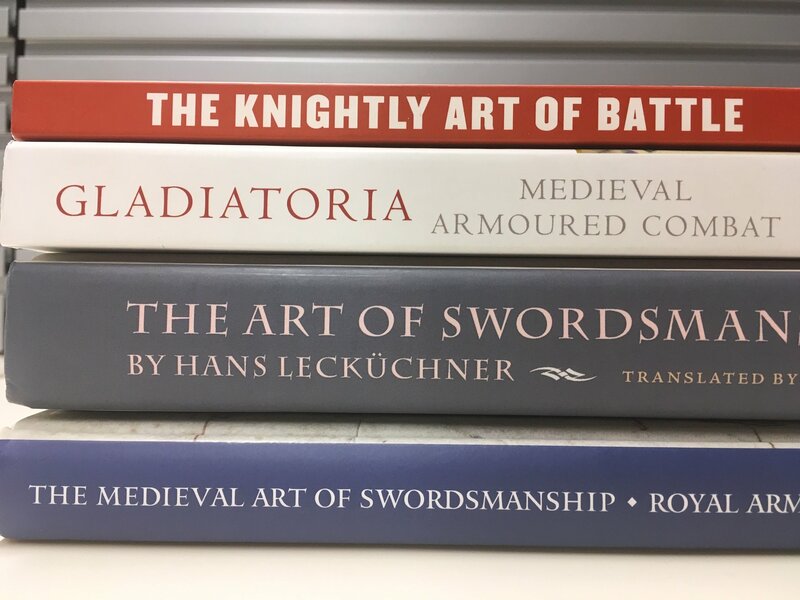 Publisher’s Overview: Completed in 1482, Johannes Lecküchner’s Art of Combat with the “Langes Messer” (Messerfechtkunst) is among the most important documents on the combat arts of the Middle Ages. The Messer was a single-edged, one-handed utility sword peculiar to central Europe, but Lecküchner’s techniques apply to cut-and-thrust swords in general: not only is this treatise the single most substantial work on the use of one-handed swords to survive from this period, but it is the most detailed explanation of the two-handed sword techniques of the German “Liechtenauer” school dating back to the 1300s. Lecküchner’s lavish manuscript consists of over four hundred illustrations with explanatory text, in which the author, a parish priest, rings the changes on bladework, deceits, and grappling, with techniques ranging from life-or-death escapes from an armed assailant to slapstick moves designed to please the crowd in public fencing matches. This translation, complete with all illustrations from the manuscript, makes the treatise accessible for the first time since the author’s untimely death less than a year after its completion left his major work to be lost for generations. Publisher’s Overview: Royal Armouries Manuscript I.33, also known as the Tower Fechtbuch or the Walpurgis Manuscript, is the oldest-known manual of swordsmanship in the western canon. Dated to c.1310, it is a stunning work of late medieval art and the Armouries’ most treasured manuscript, one so famous it has become known simply by its shelf number: I.33. This new edition includes a critical introduction, transcription and translation by Jeffrey L. Forgeng, the foremost authority on I.33. Publisher’s Overview: Hans Talhoffer’s professional fencing manual of 1467 illustrates the intricacies of the medieval art of fighting, covering both the ‘judicial duel’ (an officially sanctioned fight to resolve a legal dispute) and personal combat. Combatants in the Middle Ages used footwork, avoidance, and the ability to judge and manipulate timing and distance to exploit and enhance the sword’s inherent cutting and thrusting capabilities. These skills were supplemented with techniques for grappling, wrestling, kicking and throwing the opponent, as well as disarming him by seizing his weapon. Every attack contained a defence and every defence a counter-attack. Talhoffer reveals the techniques for wrestling, unarmoured fighting with the long sword, pole-axe, dagger, sword and buckler, and mounted combat. This unparalleled guide to medieval combat, illustrated with 268 contemporary images, provides a glimpse of real people fighting with skill, sophistication and ruthlessness. This is one of the most popular and influential manuals of its kind.